Hulk Hogan likes his cereal. But so does Andre! WWF NY, Times Square: McDonald's Vs. McMahon. A Seven Inch Bodyslam: The Toys of the World Wrestling Federation! The Worst Angle In Pro-Wrestling History! 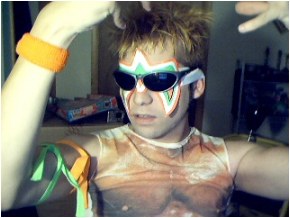 The Ultimate Warrior Wrestling Gear Set - YOU Can Be A Warrior!!! Sgt. Slaughter Joins The Ranks Of G.I. Joe!!! X-E’s ‘08 Summer Megaparty: Movie Madness. August Megaparty #8: Pokemon Party! X-E goes Upstate! X-E buys a Vader doll! THE GOBBLEDY-GOOKER! WWF's Thanksgiving Surprise!